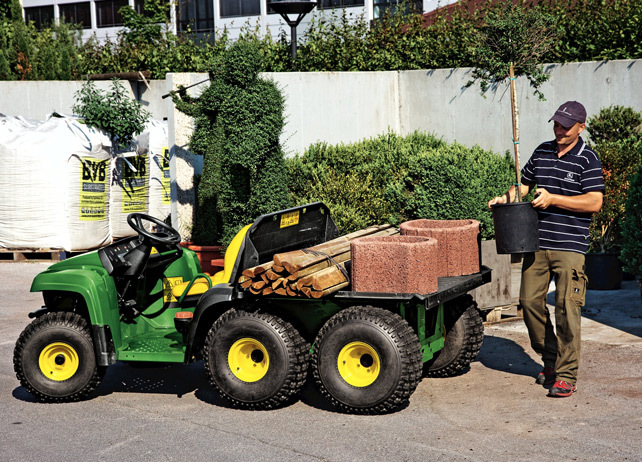 John Deere Gator UTVs come in many shapes and sizes, offering a little something for everyone, from recreational use with friends, to getting a job done around the house, in the field, or in the forest. 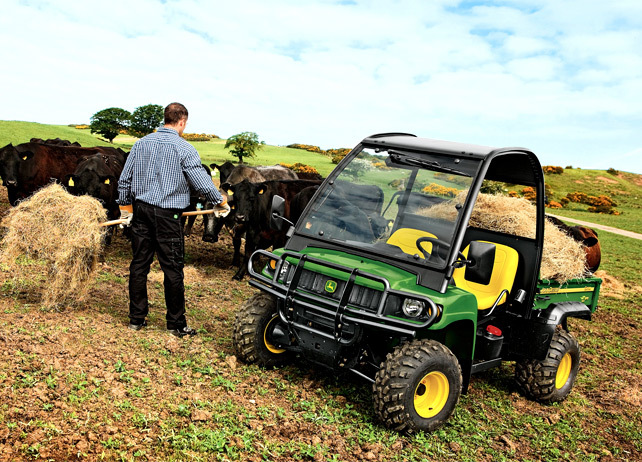 For those looking to power their experience to the next level, diesel John Deere Gators could be a perfect fit. Let’s take a closer look at three of these diesel-powered vehicles that are ready to take on any task, or simply bring recreational excitement to a new level. 1. John Deere 855D 4×4 Gator: This model is powered by an 854-cc, three-cylinder, liquid-cooled, four-cycle diesel that delivers excellent starting, idling, and throttle response during use. The 21 hp engine offers a top speed of 32mph, delivering ample speed and power for projects or pleasure. An extra-durable cargo box allows operators to store up to 1000 lbs. of weight, and attachable racks, as seen in the image below, provide even more space if needed. If you find yourself in tough terrain, the precision drive-train system utilizes engine power to fully support acceleration, hauling, towing, and hill-climbing capabilities. Enjoy this vehicle with more company, as the 855D S4 model adds a back seat that can be used to seat two more, or can be folded down for additional storage space. 2. John Deere TH 6×4 Diesel Gator: The TH 6×4 is labeled as the “problem solver,” and for good reason. This diesel model offers an additional 200 lbs. of weight capacity (1200 lbs. total) compared to its gas-powered counterpart, making it one of the best Gators on the market for storage purposes. Additionally, the extremely low load height, which is spread across six wheels, ensures the operators feet are always on the ground, even on rough terrain. So, if you’re looking for a vehicle to handle a massive project, the diesel powered TH 6×4 is without a doubt the answer, making large load transportation a smooth ride thanks to its unique design. 3. 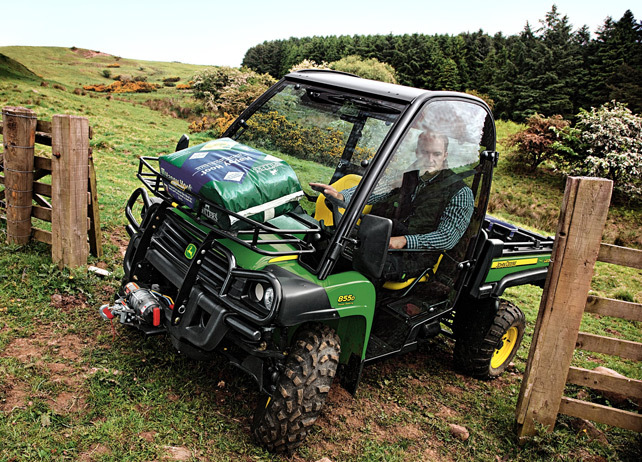 John Deere HPX 4X4 Diesel Gator: Do you often times have busy days scheduled with a number of tasks to complete in a short amount of time? The HPX 4×4 Gator addresses these issues as it’s the fastest choice in the Deere Work Utility Vehicle line-up, offering a top speed of 25 mph. This model also features 4WD with dual range CTV Transmission, making uneven terrains an afterthought. The HPX 4×4 isn’t just a fast vehicle; it can also store up to 1000 lbs. of weight in its durable steel cargo box. After the work is done, take this vehicle for a safety-filled joyride thanks to its handling capabilities and Roll Over Protection Structure (ROPS). Diesel John Deere Gators offer a little extra power to these already powerful and versatile vehicles. Feel free to let us know what diesel Gator is your favorite and what kinds of things you like to do with the machine while behind the wheel. Let us know on our Facebook page!